Show us your "Custom Homemade Tools"
I call it a "Mortise-Cleaner-outer" or a "Chip-flicker" and it is used to remove chips that fall into the mortise while you are cleaning up the sides with a chisel. 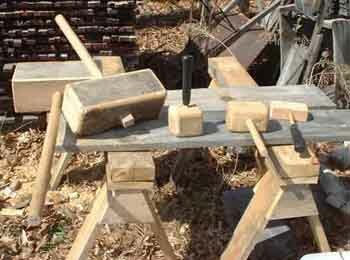 In the past I have used a combination square, a smaller chisel, a screwdriver, or just used my fingers. This modified Brick Trowel has some flex to it and has a nice built-in handle. The smaller one is an unmodified tuck-pointing tool. This is what I started out with...a used 10" Brick Trowel. I marked my cut lines to create a blade ~1.5 in. wide and ~8.5 in. long, which will get me to the bottom of most of my 2 in. wide mortises. I used a cut-off wheel on a small grinder to cut to the lines, but it left sharp and jagged edges. I used one of my "In-the-field" sandpaper sharpening jigs to flatten and straighten the edges. I also put a chisel edge to help with scraping out the bottom corners of the mortises. Next, I cleaned it up a bit and gave it a coat of Bluecreeper. I'll post some action shots this week after I use it on the jobsite. 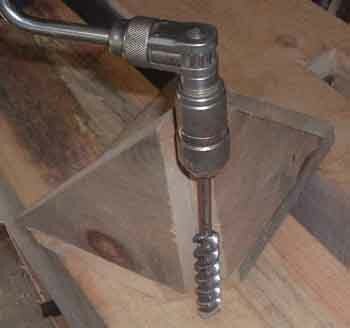 Re: Show us your "Custom Homemade Tools"
Nice idea. I usually just turn the timber over and bump it on the saw horse to clean out the mortise. Having such a tool would be nice for heavier timbers. I sing about a big man, The Canadian Lumberjack. Here's mine. I can't claim it's an original idea by any means, but it's nice and light, and doesn't make a sound except for the munching of the bit cutting wood. My old machine squeeked and creaked like crazy, it drove me nuts! Jim, what about your slider? I've got some pics of it in use. It may be made in a machine shop, but it's still "homemade". I didn't post the slider because it was made in a machine shop, not at home. I think the "slider" qualifies...on the "cool tool" chart and should be allowable in this thread. i never get tired of seeing old rusted tools revitalized back into productive use. I don't currently have any available for sale, I think. But the slider was my idea so that it can hold a combination square's ruler to the framing square for measuring and checking distances. In order for me to make another batch of these, I'd have to pre-sell some. It is a depth stop for Snell and Swan boring machines. Page created in 1.32 seconds with 41 queries.